In some, but not all, online courses you will find announcements on the first page of the course. In others, there will be a link to announcements from somewhere else. It is important to always go to the announcements page to read about any additions, assignments, or changes to your instructor’s website. 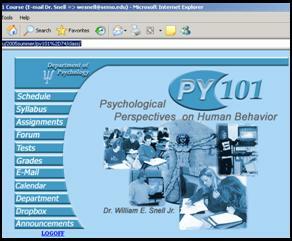 The course information, or sometimes called the syllabus page, typically gives a short description about the course. The syllabus is often found here. Items you might also find here include required textbooks, instructor contact information, grading scale, a short description of class assignments, paper topics, etc. The class materials, sometimes called assignments, pages of a course often contain the instructor’s lecture notes, handouts, and specific instructions for different sections of the course. Many instructors use the calendar feature to help students organize assignments and readings that will be required for the course. Some instructors will use a table with assignments and due dates, while others will use the OIS Calendar that lays out your assignments in a typical calendar format. Be sure to check the calendar often to make sure you are on track and that new assignments or readings have not been added.